The Mennonite Heritage Center holds numerous audio recordings from the local community in the mid-to-late 20th century. 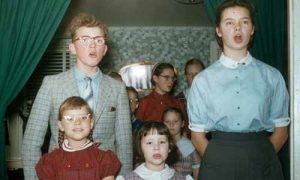 Many are of worship services, preaching and music from the 1950s to the 1970s, recorded by people like Ephraim Delp of Plains Mennonite Church, Elmer Kratz and Sallie Bergey of Franconia, Francis Kulp and Jonas Clemmer of Salford, and Henry Gross of Blooming Glen. In this example from the Elmer Kratz collection, you can hear a portion of the ordination service in which Franklin Frederick was chosen as deacon for Franconia Mennonite Church in 1965. This was the last traditional ordination by drawing of lots in Franconia Conference. There are a number of folklife recordings made by historian Isaac Clarence Kulp (click here for an inventory), and over 1,100 interviews of local senior citizens in the late 20th century conducted by students in Duane Kauffman’s Local History class at Christopher Dock Mennonite High School (see alphabetical lists below). To order a copy of a recording, contact archivist Forrest Moyer at moyerf@mhep.org or 215-256-3020 ext. 118. Please include a statement of how you plan to use it. Interviews of persons still living will not be copied or distributed without the consent of the interviewee. Special thanks to Wes Cosand, who volunteered many hours to digitize these recordings.